A very Merry Christmas Party to all! 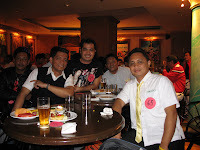 We celebrated the party for 2006 at Fiesta San Miguel in Dusit Hotel Nikko, Manila Philippines. Fiesta San Miguel is an award-winning restaurant and bar that offers freshly brewed San Miguel beer served along with Filipino dishes with a twist. As usual, there are plenty of food and drinks, lots of great prizes at stake at the raffle, and great music played by a local band. The year’s theme is based on a local movie, First Day High, where everyone is supposed to mimic the characters of the movie as follows: 1) Wear yellow and dress like a nerd; 2) Wear red and display a sporty attire; 3) Wear violet and pretend to be a socialite; and lastly 4) Wear black and dawn a bad boy, rebellious image. Everyone was so creative which made it very fun. Oh, by the way, I won star of the night! The evening would not be complete without the group presentations. We won 2nd place tied with another group. For next year, we have to work and prepare a little harder so that we’ll win the most coveted first place, not to mention the bragging rights of course. 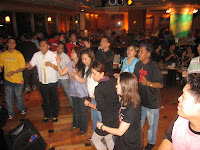 We concluded the evening with non-stop drinking and dancing. 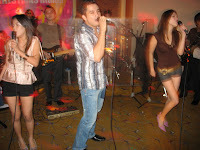 Though the place is a little cramp for our entire company, we had a great time. My personal rating of Fiesta San Miguel: 7 out of 10.